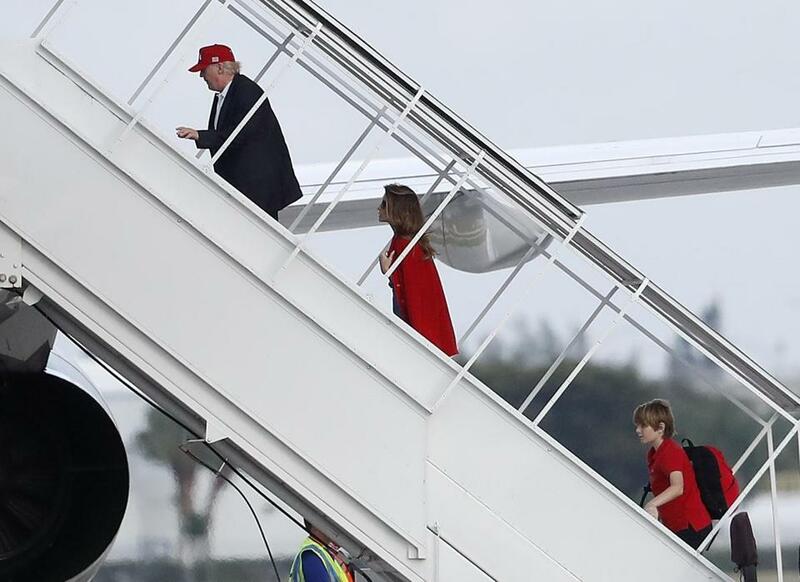 President-elect Donald Trump boarded his airplane Sunday in West Palm Beach, Fla., after spending Thanksgiving at his resort there. 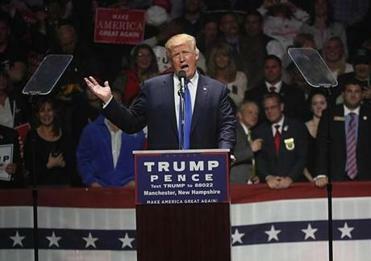 WASHINGTON — President-elect Donald Trump said Sunday, without providing evidence, that he had fallen short in the popular vote in the general election only because millions of people had voted illegally. He leveled his assertion as part of a daylong storm of Twitter posts voicing anger about a three-state recount push. “In addition to winning the Electoral College in a landslide, I won the popular vote if you deduct the millions of people who voted illegally,” Trump wrote Sunday afternoon. In an evening tweet, Trump alleged that there had been ‘‘serious voter fraud in Virginia, New Hampshire, and California.’’ His transition team did not respond to questions seeking evidence of the assertions. The series of posts came one day after Hillary Clinton’s campaign said it would participate in a recount effort being undertaken in Wisconsin, and potentially in similar pushes in Michigan and Pennsylvania, by Jill Stein, who was the Green Party candidate. Losing the popular vote by such a substantial margin apparently gnaws at Donald Trump. Is there any basis for his claim? Trump’s statements revived allegations he made during the campaign, as polls suggested he was losing to Clinton, about a rigged and corrupt system. There has been no official indication of widespread vote manipulation, illegal voting, or hacking that could have materially affected the outcome of the presidential election. The lack of evidence, in itself, suggests that Trump would be likely to prevail in any recounts, analysts have said. The Twitter outburst came as Trump is laboring to fill crucial positions in his Cabinet, with his advisers enmeshed in a rift about whom he should select as secretary of state. Officially, Trump’s transition team has dismissed the recount effort as “ridiculous” and a “scam,” saying there was no evidence of voter fraud that would justify the recounts. Clinton’s campaign has also said it has turned up no signs of such fraud or other irregularities, and the Obama administration has issued statements expressing its confidence in the validity of the vote tallies. But Trump appeared fixated Sunday on the recount and his electoral performance. In a series of midafternoon Twitter posts, not long before he boarded a flight to New York from Florida, Trump boasted that he could have easily won the “so-called popular vote” if he had campaigned only in “3 or 4” states, presumably populous ones. “I would have won even more easily and convincingly [but smaller states are forgotten]!” he wrote. The afternoon messages followed a string of early-morning Twitter posts in which the president-elect railed against the recount efforts. He went on to quote a comment by Clinton during one of their debates, in which she said she was horrified by Trump’s refusal to say that he would accept the outcome of the election. And he noted that in her concession speech, she had urged people to respect the vote results. One person who spoke with Trump over the holiday weekend said the president-elect had appeared to be preoccupied by suggestions that a recount might be started, even as his aides played down any concerns. Another friend said Trump felt crossed by Clinton, who he believed had conceded the race and accepted the results. Trump’s aides echoed his concerns about the recount effort in appearances Sunday morning television news programs. The Clinton campaign will not contribute financially to the recount effort, but it will have its lawyers present at the recount, campaign officials said. Trump returned to New York Sunday evening after spending Thanksgiving weekend at his Palm Beach estate. His transition team said the president-elect had scheduled a series of meetings Monday with prospective administration hires. Trump was mostly silent on the brewing recount effort until it became known that Clinton would join it, at least in Wisconsin. Elias said Clinton would take the same approach in Pennsylvania and Michigan if Stein were to follow through with recount requests in those states. That loosened Trump’s tongue. Clinton’s lawyer said her team has been combing through the results since the election in search of anomalies that would suggest hacking by Russians or others and found ‘‘no actionable evidence’’ of an altered outcome. Moreover, Elias said, Trump has a vote lead even in the closest states that well exceeds the largest margin ever overcome in a recount.